Ready for the ultimate beach resort destination? 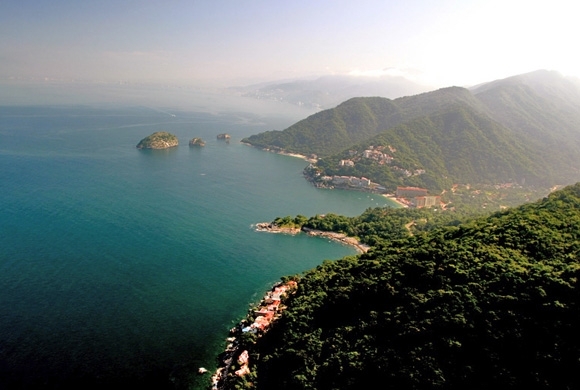 Welcome to Puerto Vallarta, a Mexican town located off the Pacific Coast of Mexico in the heart of the Banderas Bay. Bordered by the Sierra Madre Mountains, beautifully flowing rivers, stunning coastlines, and luscious jungle, this tropical paradise will provide you with the most unforgettable beach vacation. Only a three hour flight from Los Angeles, a Desert Jet private charter will swiftly fly you into Licenciado Gustavo Díaz Ordaz International Airport (IATA: PVR, ICAO: MMPR), named after former President Díaz Ordaz. Upon arrival be swept away by the natural beauty of this ideal vacation destination. Known for its legendary restaurants, authentic art, and endless activities you will never be bored. The pristine beaches of Puerto Vallarta are home to numerous aquatic sports. Test the waters while snorkeling, scuba diving, parasailing, waterskiing, or kayaking. Relax under the shady palm trees on the beach or walk along the sandy shores. Whether you came to get away from it all or for an adventure filled vacation, Puerto Vallarta has something to offer for everyone. For luxurious beachfront accommodations, escape to nearby Punta Mita, a quiet and beautiful peninsula south of Puerto Vallarta known for spectacular beaches and golf. Stay in a Mexican villa or at one of the resorts along the coast such as the Four Season Punta Mita or the St. Regis Punta Mita. Not convinced yet? Fly from tree top to tree top on a thrilling canopy zip line tour. Take a stroll down Malecon, an oceanfront walkway where you’ll find merchants, street performers, and local art and architecture. Visit Los Arcos and the Church of Our Lady of Guadalupe, two of the most recognized landmarks in Puerto Vallarta. Enjoy a taste of the local cuisine, which includes authentic Mexican, fresh seafood, and the best margaritas south of the border. All the above amenities leave even the most seasoned travelers with plenty to do. This destination is waiting for you! When you are ready to book your next private jet charter flight, please contact us at (760) 399-1000 or charter@desertjet.com, where a charter specialist will be glad to arrange your travel accommodations. Let Desert Jet take you there.